With reference to the public statement by H.E. Abdirahman Mohamed Mohamud (Farole), the President of Puntland, on the occasion of August 1 celebration held at Puntland State House in Garowe – and in line with policy recommendations issued on July 24 by the Puntland Joint Ministerial and Parliament Committee – Puntland Government hereby suspends all cooperation and relations with the Federal Government of Somalia (FGS). Since its establishment in 1998, Puntland has endeavored to build and strengthen public institutions, law and order, and delivery of basic services to the people of Puntland, whilst contributing positively to reinstituting a viable and re-united Federal Republic of Somalia since 2004. Puntland has expended critical support to reinstituting a united and federal Somalia, by investing in terms of time and energy, manpower and materials, financial resources, and political obligations for the sake of peace and rebuilding of Somalia. The expected outcome of such noble effort was a new Somalia that is sovereign, federal, united, and democratic. However, since September 2012 when the current FGS came to office in Mogadishu, the fragmented country has been plunged back into a vicious cycle of violence, displacement, clan animosities and polarization, political disputes, and a complete disregard for the country’s genuine Provisional Federal Constitution (PFC), as signed page-by-page in Nairobi on June 22, 2012, by Somali Roadmap Signatories and co-signed by UN Special Envoy as guarantor. UN Security Council Press Statement on Somalia, of July 25, 2012, recognized the genuine PFC and “welcomed some of the recent progress on the Roadmap and its associated agreements, including the June agreement of the Nairobi Protocols and publication of the new draft Constitution”. Nonetheless, in the spirit of promoting a viable reconciliation and nation-building process, Puntland advanced political dialogue with FGS and hosted Prime Minister H.E. Abdi Farah Shirdon in Garowe (March 9-11, 2013) and President H.E. Hassan Sheikh Mohamud in Garowe (April 28-29, 2013). The Puntland President has also written official letters to FGS leaders in Mogadishu and the UN, condemning the tampered and illegal constitution, which was distributed to Lower House of Somali Federal Parliament on September 7, 2012. 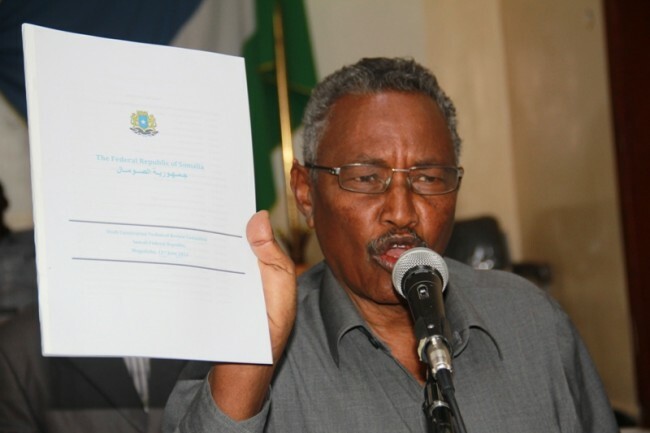 Puntland welcomes UN Security Council Resolution 2111 (July 24, 2013), encouraging the Federal Government of Somalia to set out “a clear political process toward implementing a federal structure in line with the provisional constitution”; Puntland also welcomes the Communiqué of IGAD Heads of State and Government of May 3, 2013, establishing the Principles of Engagement, including “Respect for the provisional constitution of the Federal Republic of Somalia”. 9. FGS neglects national reconciliation by rejecting to address community uprooting and the subsequent misappropriation of public and private properties and community lands, as a result of civil war conflict and social injustices in the early 1990s; and 10. FGS misrepresents Somalia and the Somali people at international forums by failing to present to the international community core national issues in Somalia. 3. ensures transparent and participatory mechanisms for fair distribution of foreign aid granted in the name of Somalia. Until above-cited matters are satisfactorily and definitively addressed, Puntland Government shall exercise rights and powers enshrined in both Puntland Constitution and Provisional Federal Government of Somalia, and Puntland Government shall be the sole representative of Puntland State in all matters in domestic and international arenas. 3. Institute effective security apparatus to combat Al Shabaab extremism and other threats to peace and stability. 4. Give urgent attention and intervention to the ongoing community uprooting and social injustices in Lower Shabelle region conducted with the complicity of Federal Government and allied militias, leading to desperation, entrenching community grievances, and spreading radicalization of communities to bolster extremists like Al Shabaab. How do you see this page? Amina Mohamed Jibril Citizen of Kenya. What is the weather today. ©2010- 2020 Soomaalinimo.se All Rights Reserved. Disgned By Mohamed Ibrahim Nor (Biikole) . Temat Häftigt Ab. Använder Blogger.